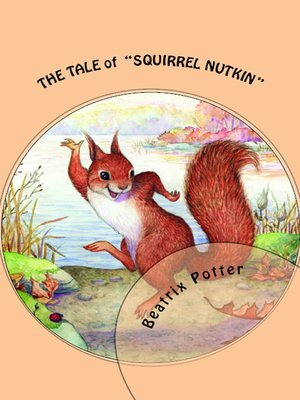 This is a Tale about a tail—a tail that belonged to a lit-tle red squirrel, and his name was Nutkin. He had a brother called Twinkleberry, and a great many cousins: they lived in a wood at the edge of a lake. In the middle of the lake there is an island covered with trees and nut bushes; and amongst those trees stands a hollow oak-tree, which is the house of an owl who is called Old Brown. One autumn when the nuts were ripe, and the leaves on the hazel bushes were golden and green—Nutkin and Twinkleberry and all the other little squirrels came out of the wood, and down to the edge of the lake. They made little rafts out of twigs, and they paddled away over the water to Owl Island to gather nuts. Each squirrel had a little sack and a large oar, and spread out his tail for a sail. They also took with them an offering of three fat mice as a present for Old Brown, and put them down upon his door-step. "Old Mr. Brown, will you favour us with permission to gather nuts upon your island?" A little wee man, in a red red coat! If you'll tell me this riddle, I'll give you a groat." Now this riddle is as old as the hills; Mr. Brown paid no attention whatever to Nutkin. He shut his eyes obstinately and went to sleep.